So it was just over a month ago that I disappeared off to Paris for a few days with J, and it was amazing. I am so used to spending my holidays sunbathing with a book or in some secluded holiday home in the UK that going to a city for a few days was a completely unknown experience. I loved it! 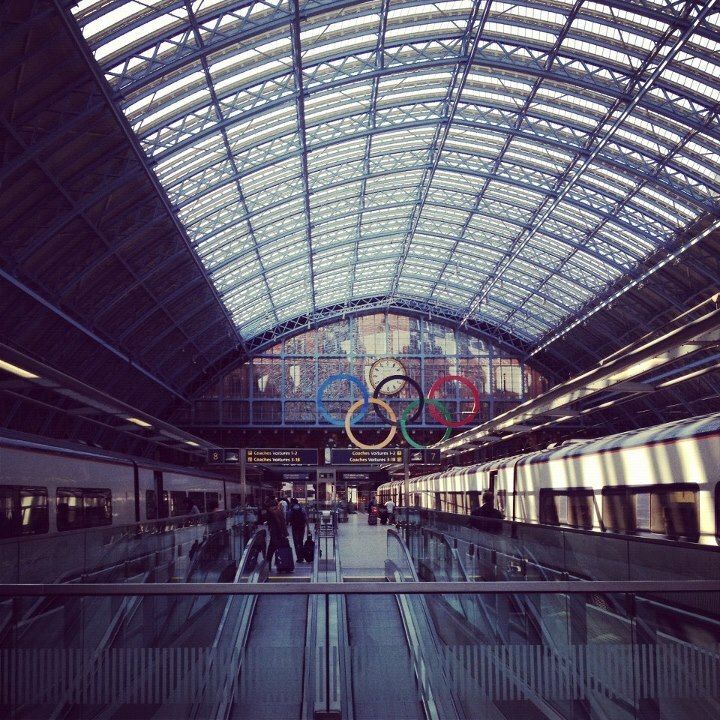 On the first day there was a fair amount of train based time, but the Eurostar was very comfortable and quite quick, and we bought our ‘Carnet’ of metro tickets on board which was handy and they lasted us the whole time there. Our hotel, Hotel Lenox Montparnasse, was only about 20 minutes from the Gare du Nord nr the Vavin metro stop and the area around it was quite quiet despite some of the reviews I had read. 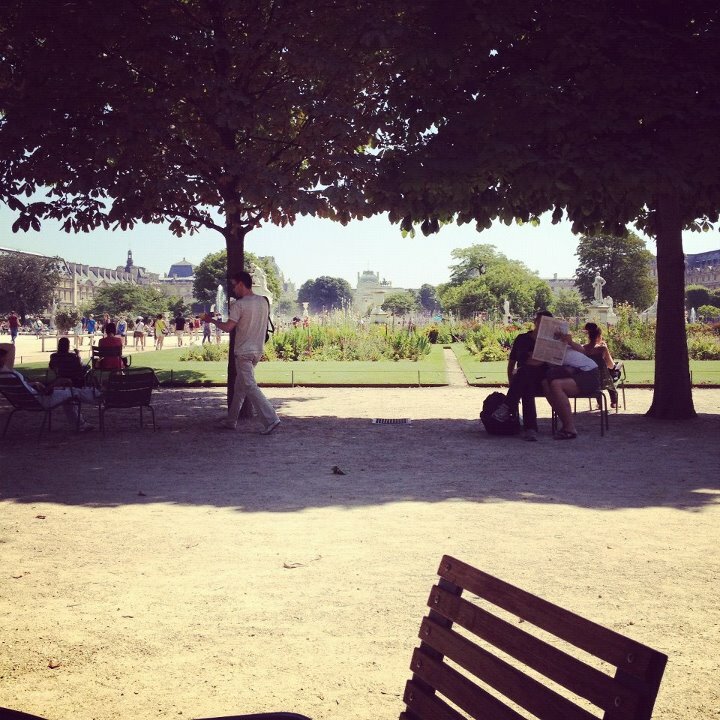 There was a really nice park ( Jardin du Luxembourg) nearby where we had our breakfast on two of the mornings. The first afternoon we dumped our things and went for a wander about, with our trusty map. It was so very hot most people were sensibly chilling out of the hundreds of green chairs that were all over the park. Note to Self: Cities are very hot in July. Pack more appropriately in the future! 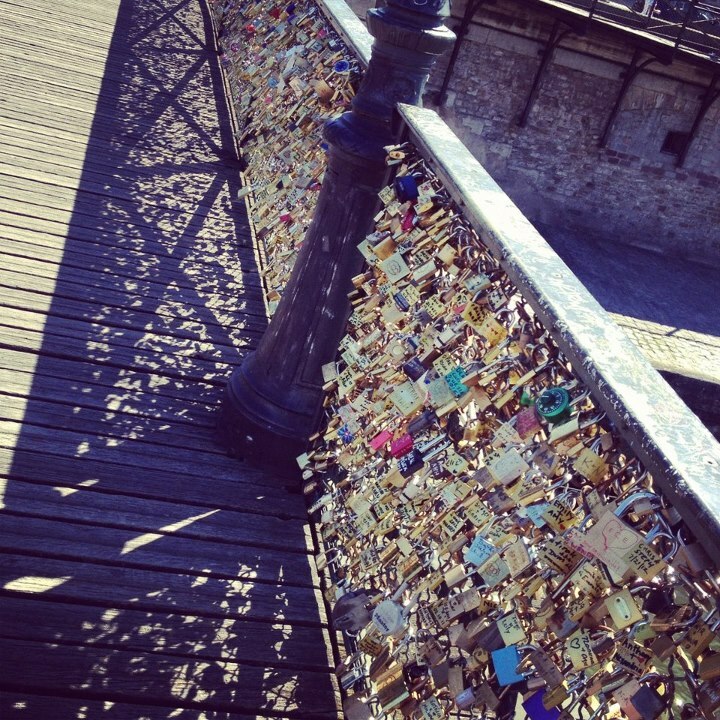 One of the first things I was excited to see, in true girly nature, was the famous bridge over the Seine that was completely covered in padlocks left by couples. The numbers were impressive to see and while we were there, there were more being added. On the second day we went and added out own and had quite chilled out day, with not too much site seeing and more just getting our bearings and eating some “interesting” food. On the third day we realised we had an awful lot to fit in and promptly headed to the Eiffel Tower to get started. When we arrived, we were greeted with a three hour long queue that snaked it’s way all the way down the road along the river. Thankfully someone in front of us mentioned that there might be a shorter queue for the stairs. The queue had got marginally smaller in the time we were up there. It was a gorgeous day to take in the view. Once we came down from the tower, I joined the longest queue in the world for the public toilets (go up in the tower, it’s much quicker!) And then we went and got tickets for a river cruise on the Seine. I do wish we had found a guided cruise with chat about the building we passed as it really was a bit of blur as to what was what. After the river cruise we went and found a lush place for lunch beside the river and chilled out for the rest of the day, with a short stop to add our own padlock to the bridge. 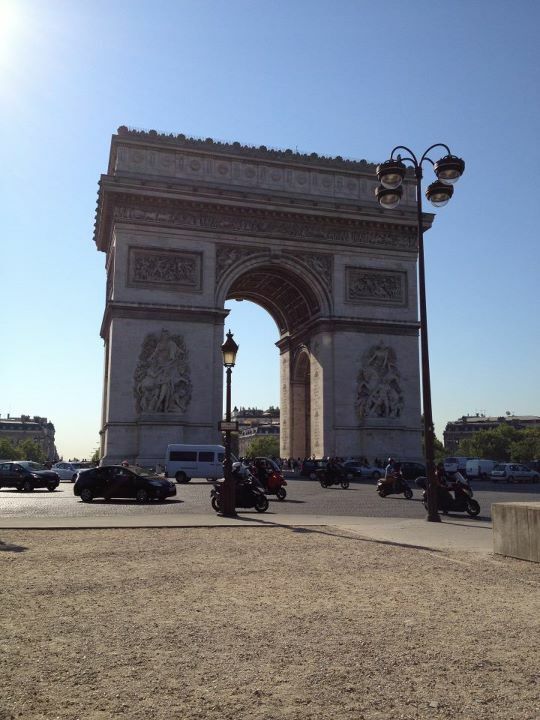 The following day we had the Arc de Triomphe, the Champs Elysees, the Place de la Concorde, Notre Dame, Sacre-Coeur Basilica, and the Louvre to get through. That’s not quite the order that we wanted to visit them in but actually it worked out for the best I think. We started at the Arc de Triomphe fairly early, and then walked along the Champs Elysees (which is a very, very long road, don’t let it fool you) which brought us accidentally to the Place de la Concorde ( I hadn’t really noted where abouts in the city it was. 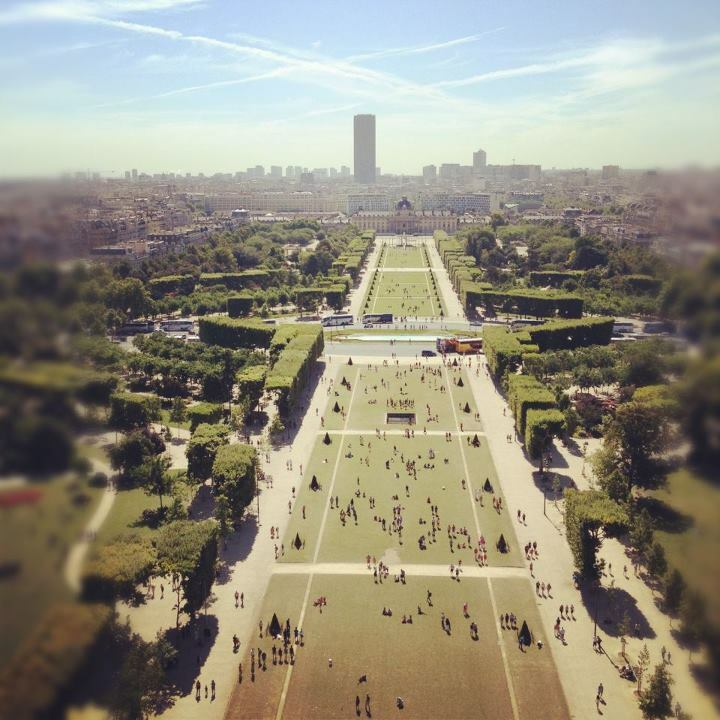 We walked through the Jardin des Tuileries towards the Louvre. I don’t think I had been more excited on the whole trip than I was as we approached it, only to realise there was a 2 hour queue in the midday sun. 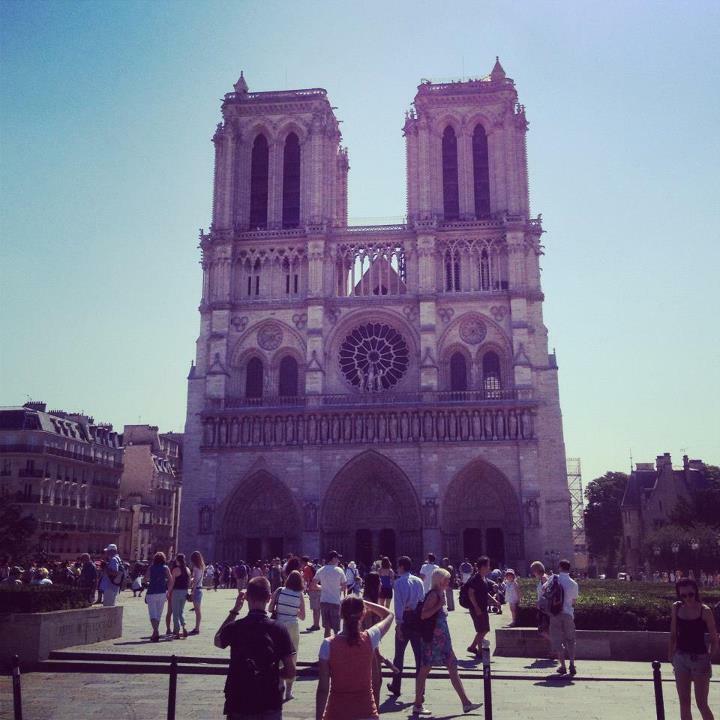 So instead of wasting precious time, we headed over to Notre Dame, the next closest place. It was FREE to get into. 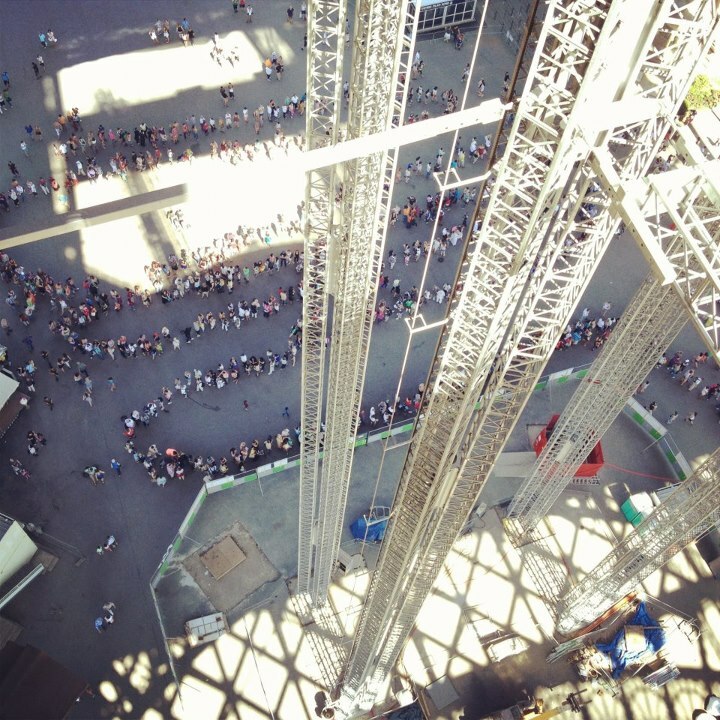 I wish we could have had a bird’s eye view while we were queuing to get in, because somehow the queue that had formed was in a spiral shape, with new people joining having to locate the centre and the walk outwards as though uncoiling. Inside it seemed so distant from the noise of the city centre, as no speaking was permitted and people were wandering round silently, or lighting prayer candles, or listening to the service. As nice a place as any for a spot of lunch. After that we headed back to the gardens because we’d passed a cafe that looked like a likely spot for lunch. 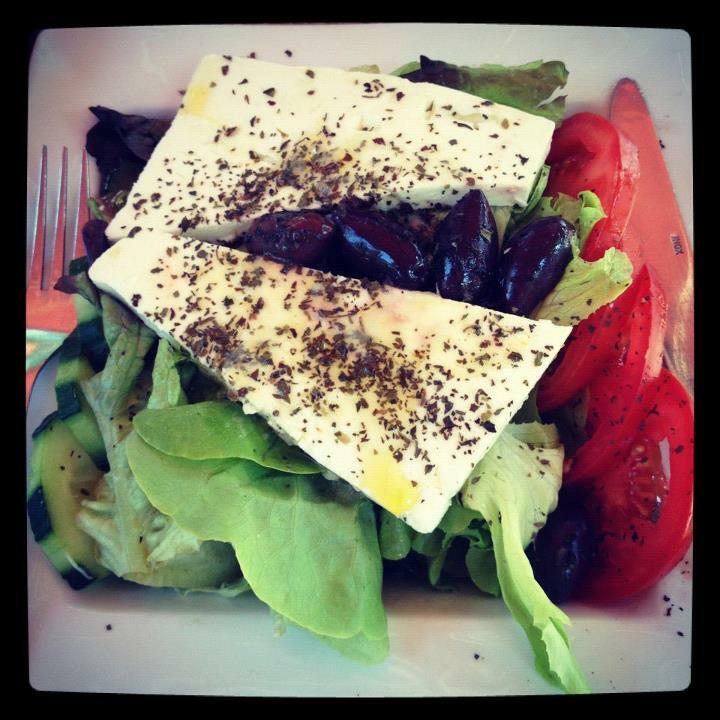 I had probably the largest Feta to salad ratio meal I ever wish to consume, but it was mighty tasty, if quite unhealthy. 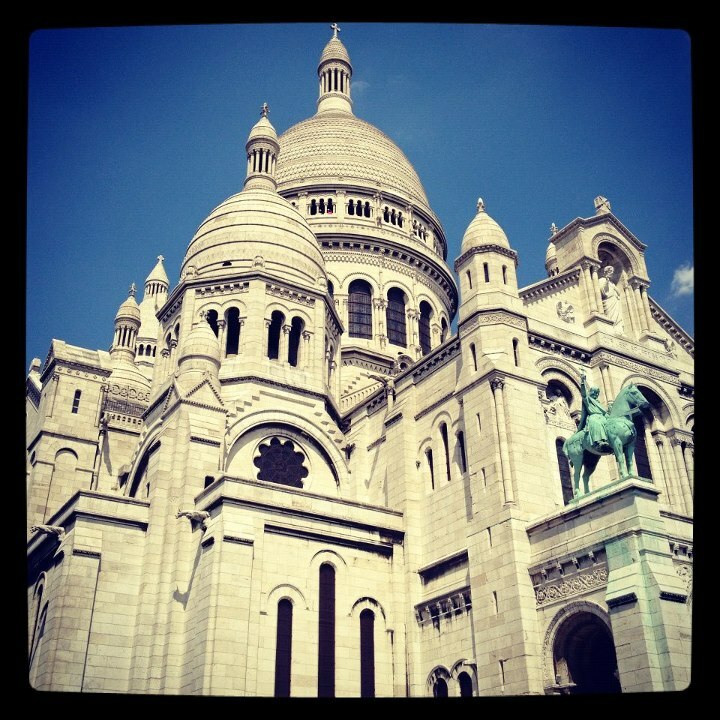 Once we were fed and watered, we headed to the nearest metro station to head up to the Abbesses station, which is one of the closest ones to the Sacre-Coeur Basilica. We headed in the right direction, after a small falling out over which was the right way( I was wrong). It seemed pretty quiet for an area that was home to one of the most popular tourist attractions in Paris, and as we got the the top of the hill we saw the beautiful church, and wandered inside, where a few other people were sitting quietly. After we had had a few quiet minutes ourselves we went to see the infamous view of the city and then realised the beautiful church that we had wandered into was not the Sacre-Coeur at all, but Saint-Pierre de Montmartre Eglise. It was massive and had hundreds of people around it. Can’t believe we nearly missed it! On the wander back towards the station, in the boiling heat, we hit up this ice-cream parlour, that had the lushest flavors. 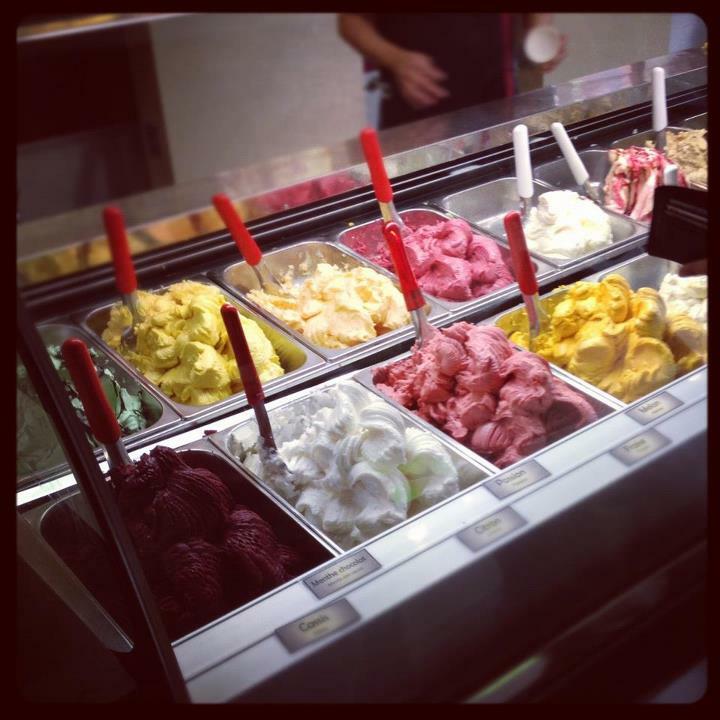 I think the place was called Tutti Sensi Gelaterie. I am planning my first adult, in charge of our own itinerary, holiday abroad. We went to Cornwall last year, drove down and stayed in a little town where some of my Uni friends are living at the moment. But this year, now feeling a little more confident, J and I are venturing off to Paris for a few days in July. We have already argued about the importance of the quality and location of the hotel we choose. I want comfortable, with a good location and decent reviews, and Jack isn’t so fussed, so long as it has a bed, and a bedside light to read his books by at night. 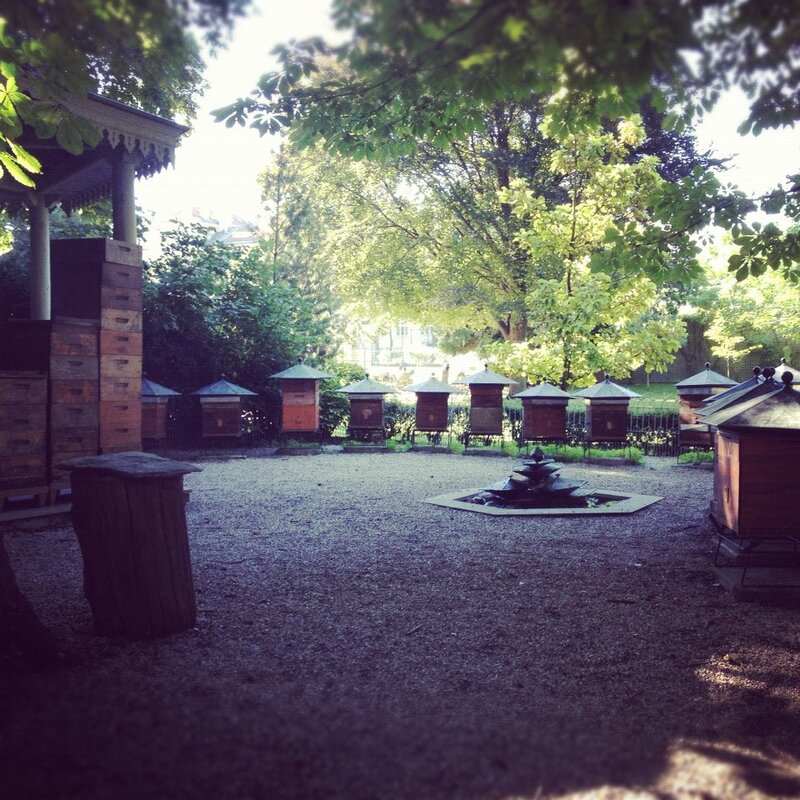 I’ve been pouring through websites offering all sorts of advice about what to do when you visit such an amazing city, cultural advice, where is the best restaurants etc. Our list of things to do is pretty obvious.The Eiffel Tower is pretty high up there, if you’ll forgive the appalling pun. Then a river tour and the Louvre. And everything really.